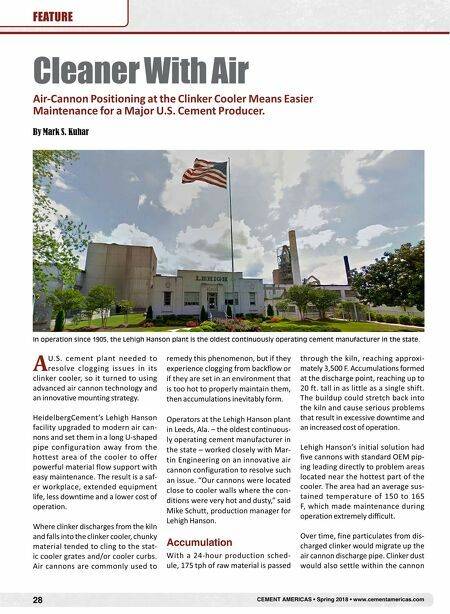 www.cementamericas.com • Spring 2018 • CEMENT AMERICAS 29 FEATURE tank, diminishing the tank's capacity and decreasing the power and effec- tiveness of the shot. Previously, workers donned hot suits and were required to remove the entire cannon from the manifold for valve service. Reported to have been one of the most unpleasant projects in the plant, at least two workers were needed to perform the maintenance and, due to the heat, they were only able to remain in the area for about five minutes at a time. "The system broke down so often, we finally just had to leave it and monitor the material buildup until the very last minute, then shut down the system for maintenance," Schutt said. "This allowed us to get the most production possible, but it caused at least a day of unscheduled downtime a few times per year." 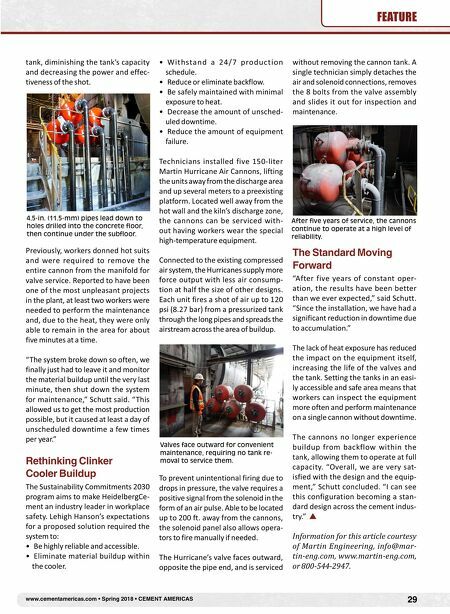 Rethinking Clinker Cooler Buildup The Sustainability Commitments 2030 program aims to make HeidelbergCe- ment an industry leader in workplace safety. Lehigh Hanson's expectations for a proposed solution required the system to: • Be highly reliable and accessible. • Eliminate material buildup within the cooler. • W i t h s t a n d a 2 4 / 7 p ro d u c t i o n schedule. • Reduce or eliminate backflow. • Be safely maintained with minimal exposure to heat. • Decrease the amount of unsched- uled downtime. • Reduce the amount of equipment failure. Technicians installed five 150-liter Martin Hurricane Air Cannons, lifting the units away from the discharge area and up several meters to a preexisting platform. Located well away from the hot wall and the kiln's discharge zone, the cannons can be serviced with- out having workers wear the special high-temperature equipment. Connected to the existing compressed air system, the Hurricanes supply more force output with less air consump- tion at half the size of other designs. Each unit fires a shot of air up to 120 psi (8.27 bar) from a pressurized tank through the long pipes and spreads the airstream across the area of buildup. To prevent unintentional firing due to drops in pressure, the valve requires a positive signal from the solenoid in the form of an air pulse. Able to be located up to 200 ft. away from the cannons, the solenoid panel also allows opera- tors to fire manually if needed. The Hurricane's valve faces outward, opposite the pipe end, and is serviced without removing the cannon tank. A single technician simply detaches the air and solenoid connections, removes the 8 bolts from the valve assembly and slides it out for inspection and maintenance. The Standard Moving Forward "After five years of constant oper- ation, the results have been better than we ever expected," said Schutt. "Since the installation, we have had a significant reduction in downtime due to accumulation." The lack of heat exposure has reduced the impact on the equipment itself, increasing the life of the valves and the tank. Setting the tanks in an easi- ly accessible and safe area means that workers can inspect the equipment more often and perform maintenance on a single cannon without downtime. The cannons no longer experience buildup from backflow within the tank, allowing them to operate at full capacity. "Overall, we are very sat- isfied with the design and the equip- ment," Schutt concluded. "I can see this configuration becoming a stan- dard design across the cement indus- try." Information for this article courtesy of Martin Engineering, info@mar- tin-eng.com, www.martin-eng.com, or 800-544-2947. After five years of service, the cannons continue to operate at a high level of reliability. 4.5-in. (11.5-mm) pipes lead down to holes drilled into the concrete floor, then continue under the subfloor. Valves face outward for convenient maintenance, requiring no tank re- moval to service them.